Monday was the final day of a 3-day VB tournament in Las Vegas my daughter was participating in. The first match was scheduled for 11a which left me a few hours in the morning for something. Tom was camped out by the Red Rock CG off SR159 so I sent him a text as I was heading out from the downtown area. Not knowing my availability ahead of time we hadn't planned to connect in the morning, but it worked out nicely that he got my message and we met at the Buckskin Cliff Shadows city park around 7:30a. Later in the afternoon we got together again for a climb of The Divided Sky along the Red Rock Scenic Loop. In between, I watched several volleyball matches while Tom did Magic Mtn, Ramp Peak and Rose Tower. Needless to say, his day was a bit more of a workout than my own. 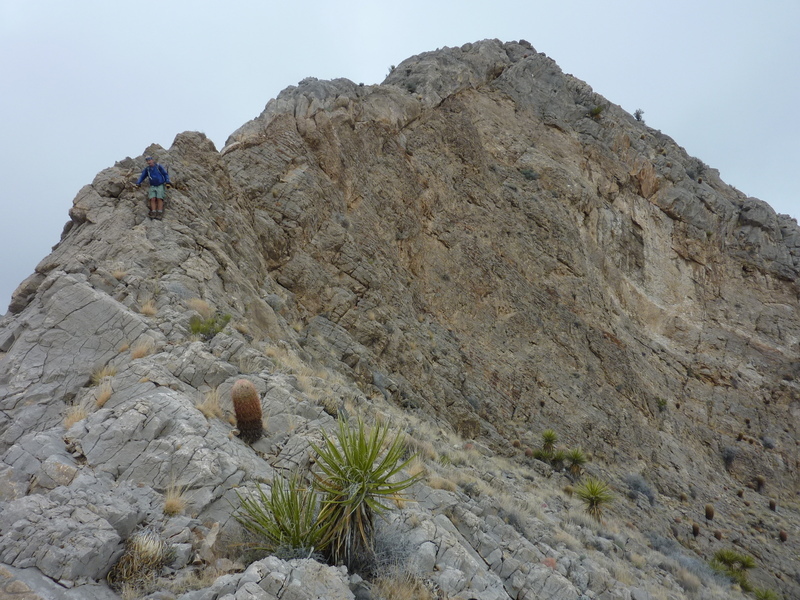 As the name suggests, this unofficially named summit rises above the Summerline neighborhood of western Las Vegas, abutting Red Rock Canyon NRA. From our TH at the city park, the hike to the summit is about 2mi one-way with just over 2,000ft of gain. A trail system runs west across the south side of nearby Cheyenne Mtn to the base of Summerlin Peak on its east side. We chose the interesting-looking NE Ridge for the ascent which turned out to be easier than it had looked, with a single, short 6-foot class 3+ move around the halfway point, with mostly class 2 terrain on either side. Clouds from a lingering storm system kept the summit shrouded from view for the entire approach and once at the summit we had only a fleeting view looking back towards Las Vegas. An ammo box held a register that was far too busy to bother photographing, evidently a popular summit with the suburban locals. We descended the SE Ridge which turned out to be a much better scramble than the ascent ridge, especially in the upper half where it is consistently class 3, often on a narrow edge. There is a significant 30-foot step/cliff that must be negotiated to stay on the ridgeline lower down. Looking a bit dicey, Tom elected not to follow after watching me descend it, eventually finding an easier way through the cliff several hundred yards further along the cliff line before rejoining me on the main ridge. We finished up back at the parking lot just after 10:15a, having taken about 2.5hrs for the effort. I had hoped we might have time to connect Summerlin Peak with Mt. Woody, higher and about 2/3mi further to the northwest. As it was, I was able to get back to the volleyball venue with maybe 10min to spare, so we'd have to save that one for another visit.